First fire | "blackberry-eating in late September"
Don’t look back. Don’t stop and talk to your loved ones. Do not pass GO or collect $200. Just grab your beer bottle, your children, your spouse, whoever, and run to your grill. You must make and eat this, now: Honey-lime Chicken Fajitas with Grilled Fresh Corn and Avocado-Orange Salad. At my request, N. just lugged our baby gas grill out for its first showing of the season. It just needed to be dusted off, scraped down, and switched on. And then we cover it with unreasonably delectable things like these fajitas from the June 2008 issue of Cuisine at Home (the recipe for the chicken can be found here). With my numerous food magazine subscriptions expired, and me on a graduate student budget, I’ve started going back through old issues by month and, rather than cooking whatever I want willy-nilly, only permitting myself to use recipes from the month we’re in. Thus this month I have four issues of various titles from June to choose from. I didn’t need to look further than June 2008, though. 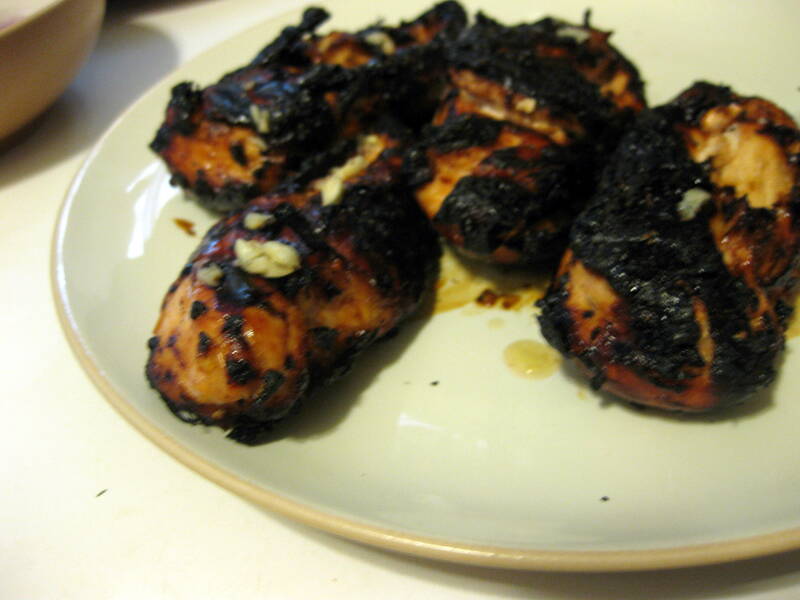 N. did an excellent job grilling the chicken breasts, which got crunchy caramelized exteriors from the honey in the marinade. While he was busy, I was able to compose our two sides. 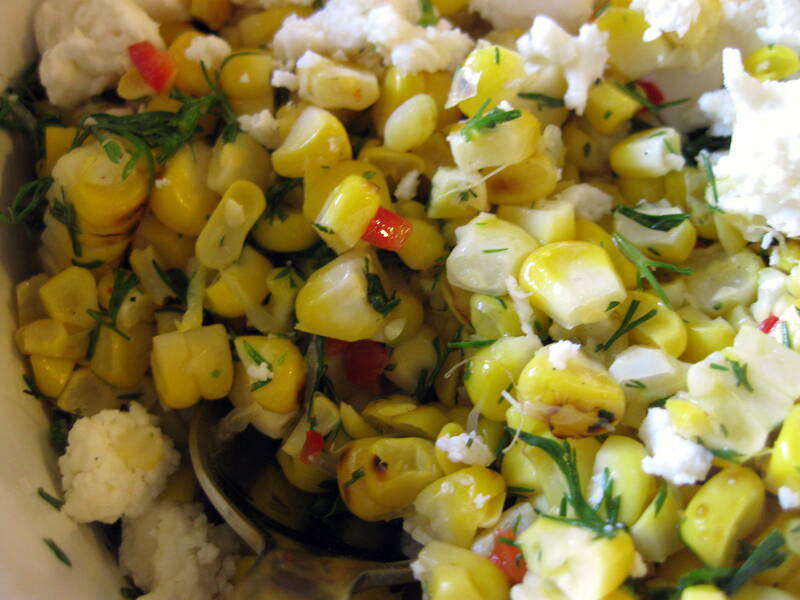 Love it or hate it, the cilantro in this grilled corn mixture added bright, grassy freshness and went with the sweetness of the corn extremely well. Surprisingly, the queso fresco I crumbled over the top went along well too, probably because the salad was all freshness and crisp juiciness, and benefited from some creamy curds of cheese. 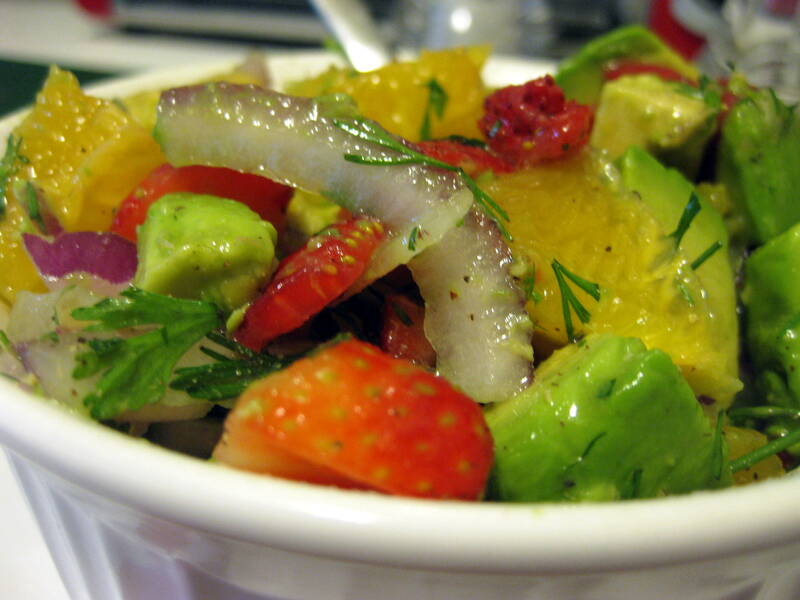 Because we had a sudden profusion (read: six) of tart garnet strawberries weighing down their respective stems in the backyard, I made a fruity addition to the Avocado-Orange salad Cuisine at Home offered. Eliminating the garlic from the recipe and using the orange’s dripping liqueur instead of lime juice (one of my limes was most reluctant to give up anything), I mixed the roughly chopped strawberries in with an avocado, an orange, a few pinches of cilantro, and some salt and pepper. Then I tried not to eat everything in the bowls while I waited for N. to bring the chicken in. Fingers burning, we sliced it, then loaded up warm flour tortillas with thick moist slices of chicken, crumbles of queso fresco, sweet juicy pops of corn, and some green salsa (not homemade, but what can you do?). 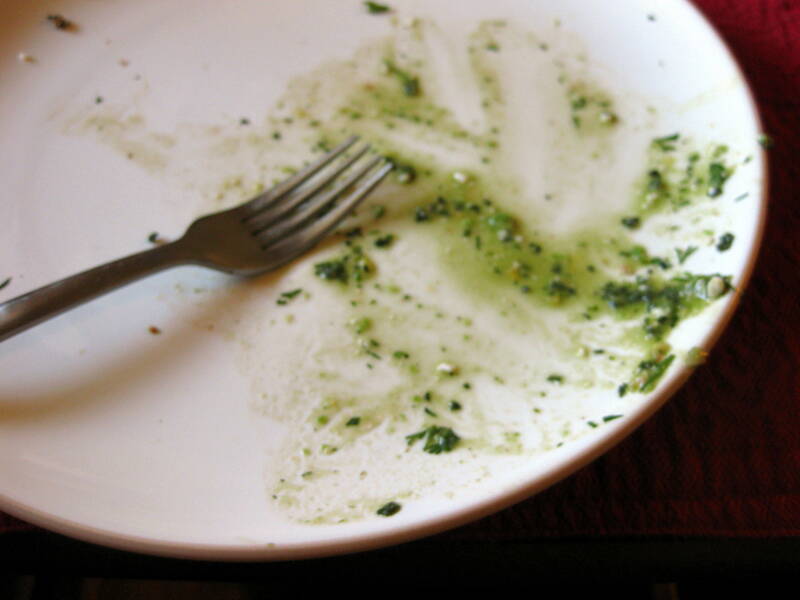 I substituted a spoonful of Avocado-Orange salad for the salsa on my second fajita, and was equally overwhelmed. So fresh. So fragrant. Such a pleasing, intriguing combination of flavors. 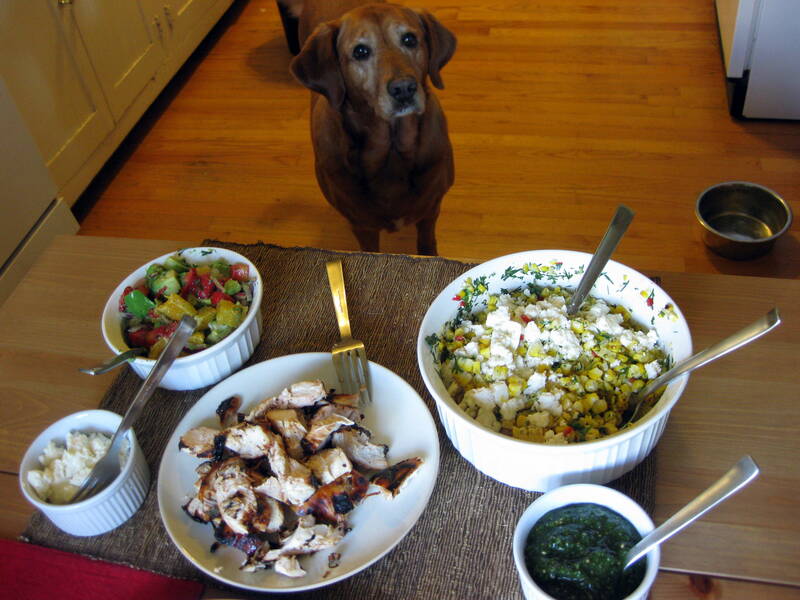 This entry was posted in Cheese, Chicken, corn, fruit, grilled, summer, Veggies by Chelsea. Bookmark the permalink.